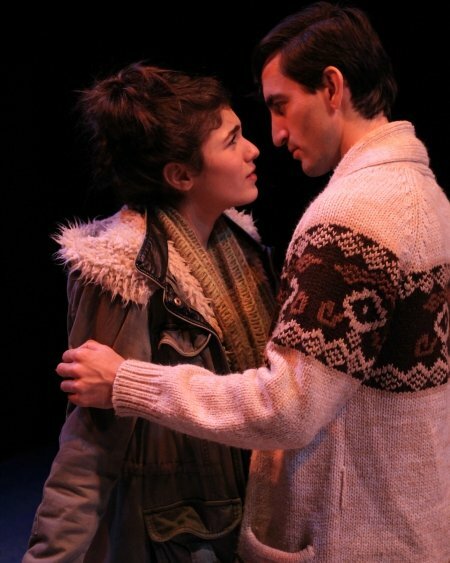 Kim Larson & Peter Carlone in the Pacific Theatre production of Almost, Maine. Photo by Ron Reed. Like the residents of Fargo, North Dakota, there is also something a little odd about the residents of Almost, Maine. Perhaps it is the long winter nights they share, but they are all endearingly quirky. In New England however, they also have trouble with the “L” word. Comprised of nine vignettes taking place over the course of one Friday night in the small unincorporated and mythical town of the title, the common thread in Almost, Maine, is love. 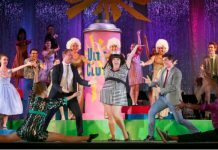 Not content to simply tell stories of love though, playwright John Cariani double-downs on the quirkiness where metaphors, idioms, and romantic clichés all come to life. A woman carries her broken heart in a bag; a couple literally falls in love; the other shoe does indeed drop. It may sound heartwarmingly ridiculous, but under Kaitlin Williams’s directorial debut, and the absolutely terrific ensemble she has gathered, it all mostly works. Cariani also helps by ensuring this heightened world of love isn’t perfect, throwing in a measure of heartbreak into the mix. In one particularly touching scene, played with perfection by Baraka Rahmani and Giovanni Mocibob, the largely feel-good nature of Almost, Maine is replaced with a heartfelt melancholy. Another of the more serious scenes, in which a young couple realize they are no longer happy together, however doesn’t quite work as well. Giovanni Mocibob and Baraka Rahmani help bring some of the more serious moments to life in Almost, Maine. Photo by Ron Reed. 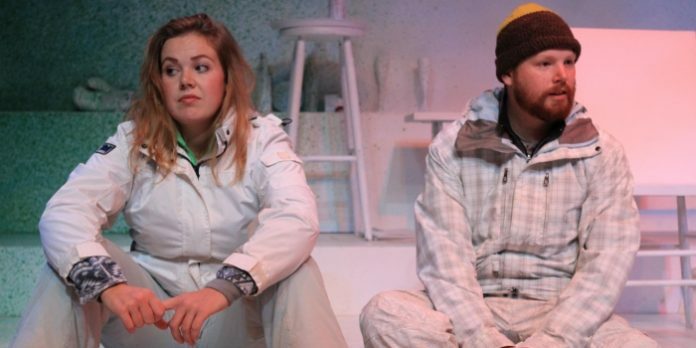 It isn’t surprising then to know this production of Almost, Maine finds the majority of its riches in the quirkiness of its characters, and the lighter side of love. Helping to ensure it works are the ensemble who step into Cariani’s characters as if donning their favourite snowmobile suit. Peter Carlone simply revels in the quirkiness of his characters. And even while the lights go down on each of his scenes with a similar goofy grin, Carlone somehow remains grounded in his natural approach to the every-man. Matching him step-for-step is Kim Larson, who finds variety and the centre in each of her every-woman characters. While Mocibob and Rahmani are most memorable in the more serious vignette about lost love, they also find real chemistry together in one of the playwright’s more balanced stories. It also happens to contain one of the funniest moments of magic realism scattered throughout the play. Jalen Saip starts and ends the play with Carlone, and while its conclusion is obvious, they are beautifully realized scenes with no sense of irony. Laughlin Johnston provides a monochrome set for the actors to play, with all the necessary props in a similar colour palette from Jenny Jatsch within easy reach. Not only eliciting the play’s snow-covered locale, it becomes its own metaphor for how, when it comes to love, everything else just simply disappears. Jay Clift provides the necessary love song snippets to help with transitions. Like life and love itself, Almost, Maine is quirky, sweet and sometimes delightfully messy. And despite its disappointing lack of snowflakes, you should definitely make this trip to New England. Almost, Maine by John Cariani. Directed by Kaitlin Williams. A Pacific Theatre production on stage at Pacific Theatre (1440 W 12th Ave, Vancouver) until December 16. Visit http://pacifictheatre.org for tickets and information.